Bob hairstyles are as popular now as they have the precious season. The different length of bob hairstyles allows to create various images and if you decide to wear your hair curly be sure to look smashing. At first sight it may seem that all curly hair is alike. But it's not true. The pictures of fantastic curly bob hairstyles below will prove it. You can experiment not only with curls' length, but with their size and tightness. You can add soft highlights to make curls more definite. Loose curly hairstyles with a bedhead effect are very popular now, but they can fit casual events, but definite and polished curls will be suitable not only for office outfit but for a formal event as well. Brown hair color with caramel highlights look gorgeous on any hairstyle, and in this short bob it just makes the style more vivid This Keira Knightley bob haircut can be considered one of the best decisions for square faces. Mond that the roots are left straight and only the ends are made slightly curly. Some highlights will be suitable in this case to freshen the looks. 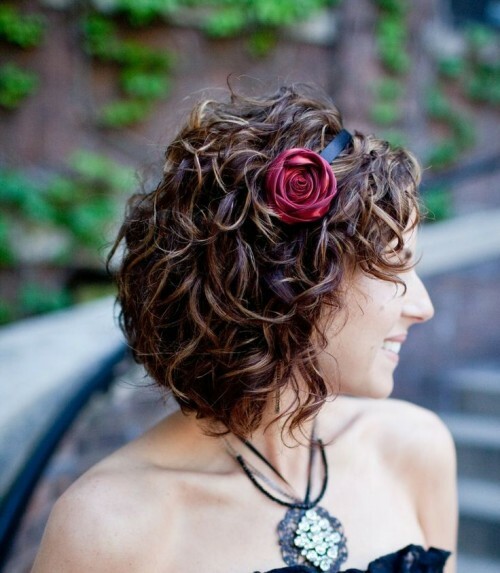 Curly bob infused with ringlets makes this hairstyle very eye catching. The ringlets all around are very cute. And if completed with a nice summer hair accessory this can be your number one 2014 hairstyle. Long bob haircuts are always very feminine and if made curly they look even more elegant and graceful. The warm chocolate color is a wise decision for the shaggy curls, And finally messy curly hairstyle, where every curls has its own life and direction but all together looks very harmonious.